Proteins were important to Pauling, but so were other things. In the late 1930s he was publishing at a dizzying rate, a new paper every few weeks, then a book as well, on topics ranging from molecular structures to quantum mechanics. In late 1937 he was rewarded with the chairmanship of the chemistry division at Caltech, a signature honor for someone so young (Pauling was thirty-six years old). His growing fame as a chemical theorist led to an invitation in late 1937 to spend several months at Cornell University as the George Fisher Baker lecturer, a prestigious appointment that provided him time to work on the manuscript of another book, this time a summary of his work on the nature of the chemical bond. When he returned to Caltech in early 1938, he found that Corey had made astonishing progress on the structure of amino acids. He turned out to be a treasure in the lab, focused, disciplined, and able to spot and train talented assistants. Corey had motivation, too: He was working for more than scientific satisfaction; he was trying to earn a permanent job during very hard economic times. He worked day and night on solving the structure of the simplest amino acid, glycine, and was getting close to a final structure. When he published his results, it marked a minor milestone in the history of protein research: the first amino acid in history to be described in full structural detail, with each atom precisely located. Corey, it turned out, was a master x-ray crystallographer. Pauling, pleased, set him to work next on diketopiperazine, a two-glycine dipeptide. Then he extended Corey's contract, providing him with a steady salary and more research support. Corey became Pauling's right-hand man in the laboratory. His even-tempered, deliberate, logical precision was a perfect complement to Pauling's theoretical leaps, chemical intuition, and tendency toward salesmanship. Corey was cautious where Pauling was bold, introspective where Pauling was brash, reticent where Pauling was impulsive. Pauling would brainstorm big theoretical breakthroughs. Corey would grind out the data needed to support them. It was a perfect match. See Also: Letter from Linus Pauling to Warren Weaver. February 23, 1938. Members of the Caltech Chemistry staff seated at the department picnic. 1941. 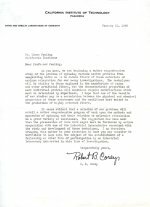 Letter from Robert Corey to Linus Pauling. January 22, 1940.